Snails of the family Lymnaeidae, as Pseudosuccinea columella, are the intermediate hosts of Fasciola hepatica, the causative agent of fasciolosis in human and livestock all over the world. A thorough knowledge of snail biology is essential for describing the transmission dynamics and for controlling this disease. Since food quality has had a significant effect on snail growth, fecundity and fertility, in this study we evaluated the use of spirulina (Arthrospira platensis) as a food resource for the artificial breeding of P. columella, an invasive snail and the main intermediate host of F. hepatica in Northeastern Argentina. The main purpose was to measure the effect of spirulina on fitness parameters such as survival rate, growth rate, size at first reproduction, lifetime fecundity and viable offspring. A total of 20 676 newly-laid F2 eggs were used; half of them were fed with lettuce (treatment L) and the other half with lettuce plus spirulina (treatment L+S). In comparison with P. columella snails fed only with lettuce, we found that P. columella fed with lettuce plus spirulina: 1) showed higher survival rates, 2) grew faster and showed higher growth increments, 3) attained sexual maturity earlier in time (L+S:60 days vs. L:120 days) and at a smaller size (L+S:4.8mm vs. L:8.2mm), 4) had a longer reproductive period (L+S:150 days vs. L:90 days), 5) produced a higher number of eggs/snail (L+S:29.6 vs. L:13.3), and 6) showed a higher offspring hatching rate (L+S:70% vs. L:40%). The supplementation of P. columella diet with commercial spirulina enhances it fitness and improved the artificial breeding of this species. Spirulina may have a direct positive effect on P. columella development by consuming it, along with an indirect positive effect by improving the water quality. This rearing technique provided large number of reproducing adults and a continuous production of offspring, which are essential for developing future experimental studies in order to improve our knowledge on P. columella biology. Key words: fasciolosis, Pseudosuccinea columella, culture technique, commercial spirulina, fitness parameters. Los caracoles de la familia Lymneidae, como Pseudosuccinea columella, actúan como hospedadores intermediarios de Fasciola hepatica, el agente etiológico de la fasciolosis, zoonosis que afecta al ganado y al hombre en todo el mundo. Conocer profundamente las características biológicas de estos caracoles resulta esencial para describir la dinámica de transmisión y controlar esta parasitosis. La calidad del alimento afecta significativamente el crecimiento, la fecundidad y la fertilidad de estos caracoles. En este estudio, evaluamos la utilización de la espirulina (Arthrospira platensis) como fuente de alimento para la cría artificial de P. columella, una especie invasora que actúa como el principal hospedero intermediario de F. hepatica en el Noreste Argentino. El objetivo principal de este trabajo fue medir el efecto de la espirulina en parámetros del fitness tales como: tasa de supervivencia, tasa de crecimiento, tamaño que alcanzan a la madurez sexual, duración del período fértil, fecundidad y viabilidad de la descendencia. Se utilizaron 20 767 huevos F2 recién puestos; la mitad de ellos fue alimentado con lechuga (tratamiento L) y la otra mitad con lechuga mas espirulina (tratamiento L+S). En comparación con las P. columella alimentadas solamente con lechuga, las P. columella alimentadas con lechuga mas espirulina: 1) presentaron mayores tasas de supervivencia, 2) alcanzaron mayores tamaños y en menor tiempo, 3) alcanzaron la madurez sexual antes de tiempo (L+S:60 días vs. L:120 días) y a menor tamaño (L+S:4.8mm vs. L:8.2mm), 4) tuvieron un período reproductivo más largo (L+S:150 días vs. L:90 días), 5) produjeron mayor cantidad de huevos/caracol (L+S:29.6 vs. L:13.3) y 6) su descendencia tuvo una mayor tasa de eclosión (L+S:70% vs. L:40%). La incorporación de espirulina como suplemento alimenticio mejoró significativamente los parámetros biológicos de P. columella y maximizó la cría artificial de esta especie en laboratorio. La espirulina podría tener un efecto positivo directo sobre el desarrollo de P. columella mediante su consumo, pero también podría tener un efecto positivo indirecto al mejorar la calidad del agua. Con la técnica de cría desarrollada en este trabajo se obtiene una gran cantidad de caracoles adultos reproductores y una continua producción de huevos que son esenciales para desarrollar futuros estudios que permitan aumentar nuestro conocimiento sobre la biología de P. columella. Palabras clave: fasciolosis, Pseudosuccinea columella, cría artificial, espirulina comercial, parámetros del fitness. Snails of the family Lymnaeidae act as intermediate hosts of several trematodes of medical and veterinary importance. Among these is Fasciola hepatica (Linnaeus, 1758), the causative agent of fasciolosis in human and livestock all over the world (Malek, 1985). This zoonotic disease causes great economic losses due to liver condemnation, increased mortality and decreased milk, wool and meat production (Hope-Cawdery, Strickland, Conway, & Crowe, 1977; Boray, 1981). To be effective, control measures should be based on a sound understanding of the epidemiology of fasciolosis, which depends mainly on environmental factors that affects the free-living stages of F. hepatica and the intermediate host populations of lymnaeid snails (Torgerson, & Claxton, 1999). In addition, F. hepatica presents high specificity and compatibility towards its intermediate hosts (Cañete, Yong, Sánchez, Wong, & Gutiérrez, 2004), making the knowledge of snail biology an essential step in describing the transmission dynamics of this disease. In nature, snails thrive under diverse and changing environmental conditions, making it highly difficult to calculate essential biological variables such as growth rate, fecundity, survival and longevity (Eveland, & Haseeb, 2011). These biological characteristics are often studied under laboratory-controlled conditions, as such, a successful rearing system is the first requirement for maintaining the life cycle of snails (Eveland, & Haseeb, 2011). Although lymnaeid snails are prolific in their natural environment, a number of important physical and biological factors must be taken into consideration for their successful cultivation, for e.g. temperature, food resource and water quality (Islam, Port, & McLachlan, 2001). Temperature affects directly the growth, the age of sexual maturity, and the fecundity of lymnaeid snails (Vaughn, 1953; Claxton, Sutherst, Ortiz, & Clarkson, 1999; Islam et al., 2001). Tap water is not recommended unless it is stored in aquaria to eliminate harmful substances like chloramines; most researchers recommend the use of filtered water (Malek, 1985). Food quality, rather than food quantity, determines snail development (Skoog, 1979), and although snails can live solely on a diet of lettuce leaves, they grow faster, much larger and can lay more eggs when their diet is supplemented (Eveland, & Haseeb, 2011). Arthrospira platensis (Nordstedt) Gomont is the scientific name of the commercial spirulina, a photosynthetic bacteria, commonly called ‘blue-green algae’ (Small, 2011), rich in protein, vitamins, essential amino acids, minerals, essential fatty acids and antioxidants pigments (Belay, Kato, & Ota, 1996). The high nutritional values of spirulina encourage its recent application as an animal feed supplement, producing beneficial effects on growth rate, tissue quality and survival in fishes, prawns and other freshwater and marine species (Belay et al., 1996). To date, no investigations have been carried out to evaluate the effect of spirulina on the development of freshwater lymnaeid snails, and consequently, it is not often used when rearing these snails in the laboratory, with the exception of some European and African species, such as Lymnaea stagnalis (Linnaeus, 1758) and Lymnaea natalensis (Krauss, 1848) (DeKock, & Joubert, 1989; Khan, & Spencer, 2009). Pseudosuccinea columella (Say, 1817) is a North American species (Malek, 1985) with a great potential to invade new areas (Boray, Fraser, Williams, & Wilson, 1984; DeKock, Joubert, & Petrorius, 1989). Actually it has a worldwide distribution and was reported in Europe, Oceania, Africa and America (Madsen, & Frandsen, 1989). In Central and South America, P. columella enlarged its distribution area and was reported from Cuba (Gutiérrez, Pointier, Yong, Sanchez, & Theron, 2003), Guadalupe island (Durand et al., 2002), Puerto Rico, Mexico, Jamaica, Guatemala, Costa Rica, Panamá, Ecuador, Brasil, Paraguay, Argentina (Paraense, 1982), Colombia (Salazar, Estrada, & Velásquez, 2006), Venezuela (Malek, & Chrosciechowski, 1964), Uruguay (Heinzen, Castro, Pepe, & Ibarburu, 1994) and Perú (Larrea, Flórez, Vivar, Huamán, & Velásquez, 2007). The role of P. columella as intermediate host of F. hepatica was confirmed in Cuba (Gutiérrez et al., 2011), Colombia (Salazar et al., 2006), Brazil (Coelho, Lima, & Guimaraes, 2009), Argentina (Prepelitchi et al., 2003), New Zealand (Harris, & Charleston, 1976), Australia (Boray et al., 1984) and France (Pointier, Coustau, Rondelaud, & Theron, 2007) among others. Most of the knowledge about this non-native species comes from ecological works developed in the field (Prepelitchi et al., 2011). No experimental studies have been performed to study the biology of this species, and this information would be useful to better understand the ecological results as well as the role of P. columella in the transmission of F. hepatica. The objective of this work was to evaluate the effect of spirulina as a supplementary food resource for the artificial breeding of P. columella. The major purpose is to measure the effect of spirulina on fitness parameters such as survival, growth, size at first reproduction, lifetime fecundity and viable offspring of P. columella. The ultimate goal is to develop a breeding system that provides a large number of reproducing adults and a continuous production of offspring to be used in future biological assays, in order to increase our knowledge on this invasive and biomedically important species. Wild Pseudosuccinea columella snails were collected in the locality of Berón de Astrada (27°33’13’’ S - 57°32’51’’ W), Corrientes province, Northeastern Argentina and transported alive to the laboratory. Wild and first-generation (F1) P. columella snails were raised in 1.5L glass aquaria filled with 1L of dechlorinated and aerated filtered water. Water temperature was maintained at 22.5ºC±1.5 and snails were kept under a 12:12 light:dark photoperiod and fed ad libitum with lettuce leaves (Lactuca sativa). A total of 20 676 newly-laid F2 eggs were used to test the effect of spirulina (Arthrospira platensis) on P. columella fitness parameters. Half of the eggs were fed with lettuce leaves (treatment L) and the other half with lettuce leaves plus spirulina (treatment L+S). Spirulina was purchased in a dry, powdered form (Algas de Tierra del Fuego®, Ushuaia, Tierra del Fuego, Argentina) and was dissolved in dechlorinated filtered water to obtain a stock solution of 33.3mg/mL. Each treatment was replicated six times and each replicate contained 1 723 eggs in a 1.5L glass aquarium filled with 1L of continuously aerated and dechlorinated filtered water. The 12 glass aquaria were randomly divided into three groups of four (n=2 from each treatment). Each group of 4 glass aquaria was placed in a plastic tray of 30x80x10cm, filled with tap water and installed with electric heaters in the centre to maintain water temperature at 22.5ºC±1.5. They were kept under a 12:12 light:dark photoperiod. Pieces of shade cloth and styrofoam were placed inside each glass aquarium as support and oviposition substratum, respectively. Food source was added as per the treatment protocol; six glass aquaria were supplemented with lettuce leaves (L), and the other six, with lettuce leaves plus 1mL of the spirulina stock solution (L+S). Snails in each glass aquarium were followed from laying to death (lifetime). Treatments ended when the last F2 P. columella adult had died. Every three days, all aquaria were cleaned, water was changed, unconsumed food and dead snails were discarded, and clean filtered water and fresh food were added as per the treatment protocol. The number of F2 eggs that successfully hatched was counted and the date of hatching was registered in each of the six replicates of treatments L and L+S. Following hatching, the number of live snails and their shell lengths were measured at 15, 30, 60, 90, 120, 150, 180, 210 and 240 days post-laying (dpl), in each of the six replicates of treatments L and L+S. Shell length was measured from the apex to the anterior margin using a light stereomicroscope (Zeiss Stemi 2000-C, Carl Zeiss Jena GmbH, Germany) equipped with a 10x eyepiece lens and an ocular micrometer. When the first F3 egg capsule was discovered in a glass aquarium, the shell length of all the live snails inside that recipient were measured to determine the mean size at first reproduction. The date was also recorded to determine the age at first reproduction. All newly-laid F3 eggs were removed from their parents aquarium and placed in newly glass aquaria, where they were monitored until they hatched. The number of F3 eggs that successfully hatched was registered. Once a month, water temperature, pH, conductivity and dissolved oxygen were measured using a Sper Scientific® water quality meter (850081), and carbonate, general hardness, nitrite, amonia and carbon dioxide were measured with a Tetratest® Laborett Kit. The experiment was a repeated measure design with repeated measures of snail growth and survival over time, with glass aquaria as the experimental units. Growth (defined by the dependent variable of mean shell length) and survival (defined by the dependent variable of number of live snails) were analyzed using the repeated measures generalized linear model (RM-GLM) procedure of Infostat V.12 software (Di-Rienzo et al., 2012). Treatments, days-post laying (time) and treatment by time interaction were included in the model as fixed effects. Akaike’s AIC criterion was used for choosing the optimal model. When differences between treatment, time or treatment by time interaction were significant, differences between means were determined by Fisher LSD test (Di-Rienzo, Macchiavelli, & Casanoves, 2011). Growth increment (G) was calculated using increments of mean shell length according to the following equation: G=(W1-W0)/(t1-t0) where W0 and W1 are the mean shell length at times t0 and t1, respectively (Nasution, & Roberts, 2004). F2 and F3 hatching rates, measured as proportions, were compared between treatments using a Chi-squared (χ2) test for independent samples (Fleiss, 1981). Mean shell length at first egg-laying (sexual maturity) and lifetime fecundity (total F3 egg production) were recorded and compared between treatments using the nonparametric Mann-Whitney U-test for independent samples (Daniel, 1990). Water chemistry measurements were compared between treatments using the nonparametric Mann-Whitney U-test for independent samples (Daniel, 1990). In all cases, differences were considered significant at p<0.05. Statistical analyses were performed using the Infostat V.12 software (Di-Rienzo et al., 2012). The repeated measures generalized linear model on survival of Pseudosuccinea columella snails demonstrated a significant treatment by time interaction (F8,85=4 144.39, p<0.0001; Fig. 1). Pseudosuccinea columella F2 eggs began hatching 15 dpl in both treatments (L: lettuce, and L+S: lettuce plus spirulina) and the number of eggs that successfully hatched was similar in L (n=5 851) and in L+S (n=5 955, p>0.05; Fig. 1). From hatching onwards, P. columella snails fed with spirulina showed significantly higher survival rates, in comparison with snails fed only with lettuce (LSD, p<0.05 for treatment comparisons at each time interval). The number of hatchings that survived at 30 dpl and became juveniles, the number of juveniles that survived at 60 dpl and became adults, and the number of adults that survived from one time interval to the next, were always higher in P. columella snails fed with spirulina (Fig. 1). Maximum life-span of P. columella snails was 262 days. The repeated measures generalized linear model on growth of Pseudosuccinea columella snails revealed a significant interaction between treatment and time (F8,80 =4.67, p<0.0001; Fig. 2A). Between hatching (15 dpl) and 150 dpl, P. columella snails fed with spirulina (treatment L+S) were significantly bigger than snails fed only with lettuce (treatment L) (LSD, p<0.05 for treatment comparisons at each time interval). From 180 dpl onwards, the sizes of snails in both treatments were similar (LSD, p>0.05; Fig. 2A). After 240 days, mean shell lengths (±SD) of snails fed with and without spirulina were 14.97±0.21 and 14.32±0.97mm, respectively. Pseudosuccinea columella snails fed with and without spirulina exhibits different patterns of growth increment, as can be seen in Figure 2B. 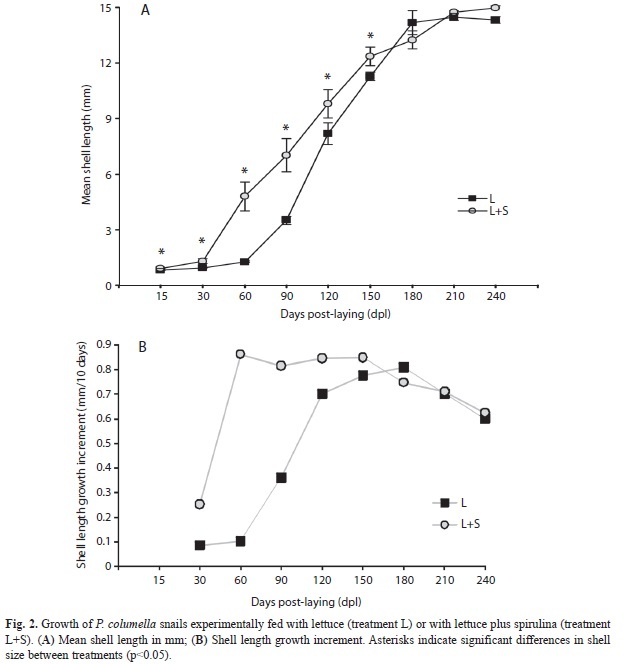 Snails fed with spirulina (treatment L+S) showed a low initial growth increment, followed by a high and sustained increase of this parameter between 60 and 150 dpl, after which growth increment gradually decrease (Fig. 2B). 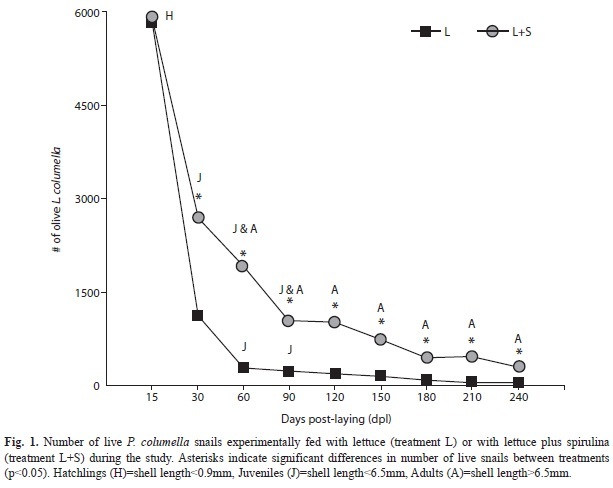 In contrast, snails fed only with lettuce (treatment L) showed a very low growth increment during their first month of life (30-60 dpl) and then gradually increased until day 180 post-laying, when they reached a growth increment comparable to that of P. columella snails fed with spirulina. From 180 dpl onward, growth increment gradually decreases in both treatments (Fig. 2B). The reproductive parameters of P. columella also differed between treatments. P. columella snails fed with spirulina attained sexual maturity at a smallest size (mean shell length=4.8mm; n=1 907) in comparison to P. columella fed only with lettuce (mean shell length=8.2mm, n=177; U=15.0, p<0.01). In addition, P. columella fed with spirulina reached sexual maturity at day 60 post-laying, whilst those fed without spirulina at day 120 post-laying. The duration of the reproductive period was of 150 days and 90 days for P. columella fed with and without spirulina, respectively. Finally, the total number of eggs deposited per adult snail was also higher in treatment L+S (29.6 vs 13.3; U=4.0, p<0.04). The number of eggs laid per adult P. columella fed with spirulina increased gradually between 60 and 120 dpl (1.6 and 34.6 eggs/adult, respectively), peaked at 180 dpl (56.7 eggs/adult) and decreased at 210 dpl (31.5 eggs/adult), which was the end of their reproductive period. In contrast, the maximum number of eggs laid per adult P. columella fed only with lettuce was between 120 and 150 dpl (23.4 and 27.7 eggs/adult, respectively), and drastically decreased from 180 dpl onwards (4.2 eggs/adult). The viability of these eggs also differed between treatments. The percentage of viable F3 offspring in L+S was significantly higher (70% vs 40%; χ2=76.85, p<0.05). Water chemistry values are shown in Table 1. The water from glass aquaria where snails were fed with lettuce plus spirulina showed higher values of conductivity, dissolved oxygen, carbonate, general hardness, nitrite and carbon dioxide, lower values of ammonia and equal values of pH and temperature (Table 1). Our results clearly showed the benefits of using spirulina as a dietary supplement for breeding P. columella under laboratory conditions. Individuals fed with lettuce plus spirulina showed higher survival rates, grew faster and showed higher growth increments, attained sexual maturity earlier in time and at a smaller size, had a longer reproductive period, produced a higher number of eggs, and showed a higher offspring hatching rate. The hatching date (15 dpl) of the F2 eggs and their percentage of hatching, not surprisingly, were similar for eggs cultured with and without spirulina (57.6% and 56.6%, respectively). This could be explained by the fact that larval development depends mainly on resources inside the eggs, rather than on food sources available in the water (Nagle, Akalal, & Painter, 1999). The present results suggest that embryonic development is not influenced by the presence of spirulina. However, the nutrition status of the parents may influence the quality and quantity of yolk volume in the egg masses, since well-fed snails will produce eggs with better albume quality (Islam et al., 2001). This could be the reason for the observed higher hatching rates among the F3 eggs deposited by P. columella fed with spirulina. Evidently, adults fed with spirulina were able to produce better quality eggs with higher survival rates, which results in a higher number of viable offspring. P. columella snails fed with lettuce plus spirulina showed a higher survival rate and a higher growth increment during their whole life, but especially on the first months of life (30-60 dpl). Newly-hatched snails usually remain attached to the bottom of the glass aquarium, exactly where the spirulina was settled, and probably served as their primary food source. Hatchlings do not usually come to the water surface, where lettuce leaves are floating. According to Dillon (2000), algae serve as food for the youngest snails until they have grown to a size at which other diets can be supported. In this sense, when snails grow and their radula is fully developed, they are able to graze on a variety of food sources, such as lettuce, spinach, higher plants, fish food, among others (Skoog, 1979; Islam et al., 2001). Accordingly, the spirulina probably constitutes the main source of food for the youngest P. columella. When this critical stage of development is past and snails reach bigger sizes, they would also begin feeding on the floating lettuces leaves too. In this sense, P. columella snails fed without spirulina showed higher mortality rates, and those that survived had a slower growth increment, and equal the size of P. columella snails fed with spirulina after 180 dpl. As mentioned before, the quality of the diet provided as food for raising lymnaeid snails under laboratory conditions had a significant effect on their growth, fecundity and fertility, as well-fed snails became larger and laid more eggs (Rondelaud et al., 2004). Several studies have demonstrated that food quality determines a better snail development (Skoog, 1979), and it is generally accepted that when high quality food is available, lymnaeids will produce more eggs (Islam et al., 2001). Clearly, lettuce leaves plus the supplemental of spirulina constitutes a better quality source of food for P. columella, as the individuals fed with this combination showed bigger sizes, faster growth rates, become sexually mature early in time and laid more eggs, which in addition had higher hatching rates. Spirulina is generally regarded as a rich source of protein, vitamins, essential amino acids, minerals, essential fatty acids and antioxidants pigments (Belay et al., 1996). All these properties would account for the better nutritional effects observed in P. columella fed with this alga. Snails fed with spirulina enhanced significantly their fitness parameters. Another factor that must be taken into account is the effect of spirulina on water quality. Although in both treatments the water was suitable for P. columella maintenance, the supplementation with spirulina improves the quality of the water. In the glass aquarium with spirulina the water was much harder (GH=8ºdh, KH=7ºdh vs GH=5ºdh, KH=4ºdh), and hardness is of vital importance since calcium in the water is used in the construction of the snail’s shell and regulates the osmotic pressure of the snail’s tissue (Van-Someren, 1946). Snails reared in harder water have harder shells with a cleaner and brighter surface (Van-Someren, 1946). Dissolved oxygen (DO2) was also higher in the glass aquarium with spirulina (7.2mg/L vs. 5.4mg/L). Lymnaeids are pulmonate snails that can obtain oxygen either from the air and from the water (Ghiretti, & Ghiretti-Magaldi, 1975). However, the more aquatic species, like P. columella, which spend their entire life without rising to the surface, require higher concentrations of dissolved oxygen in the water to breathe (Cuezzo, 2009). Accordingly, higher levels of dissolved oxygen in the water will improve the development of P. columella, as was observed. High levels of ammonia (>0.8mg/L) reflect the contamination of the water due to the decomposition of organic matter (snail excreta, decaying residues and left-over food). Ammonia is poisonous and very harmful to snails, so the desirable level for rearing them is zero (Camargo, & Alonso, 2006). In glass aquaria with spirulina no ammonia was detected, whilst in those aquariums without spirulina a level of 0.3mg/L was found. Although was not investigated in this study, spirulina could be removing toxic ammonia from the medium, as has been observed for other algae (Cohen, Finkel, & Sussman, 1976). All these results may suggest that the adding of spirulina improves the development and fitness of P. columella in a direct and in an indirect way; in the former case by consuming it and in the latter by improving the water quality. Only a few experimental works have been conducted to study the life history of P. columella under laboratory conditions (León-Dancel, 1970; Souza, & Magalhães, 2000), and in all of them, snails were reared and maintained under very different conditions of temperature, food, substratum, photoperiod, etc. As was already stated, growth, fecundity, fertility and survival are affected by these variables (Islam et al., 2001), and therefore, the comparison of the results presented here with that of the other published data is very difficult. In conclusion, this study has been novel in demonstrating the benefits of using spirulina as a food source for rearing P. columella in the laboratory. We provided evidence that the supplementation of P. columella diet with commercial spirulina enhances it fitness and improves the artificial breeding of the species. The present study is the first to reveal the benefits of incorporated spirulina as a food source for breeding P. columella (and other Lymneids) snails in laboratory. Snails fed with spirulina showed enhanced fitness parameters showing higher survival and growth rates, smaller size at first reproduction, longer reproductive period and enhanced lifetime fecundity and offspring viability. The aquaculture breeding technique described here is strongly recommended for breeding this species, because it will provide large numbers of reproducing adults and viable offspring that can be used in future biological assays to provide accurate information on some biological aspects of P. columella, such as, how long can these snails live, what is the relationship between size and age, at what size does egg-laying begin and finish and what is the duration of their reproductive life. We thank Claire Standley of Princeton University for her valuable comments on the manuscript and José Alvarez of Universidad Nacional del Nordeste (UNNE) for his field assistance. This research was supported by grants from Consejo Nacional de Investigaciones Científicas y Técnicas, Argentina (CONICET, PIP 0821) and Agencia Nacional de Promoción Científica y Tecnológica, Argentina (ANPCYT, PICT 00031). Received 13-VIII-2014. Corrected 30-X-2014. Accepted 26-XI-2014.